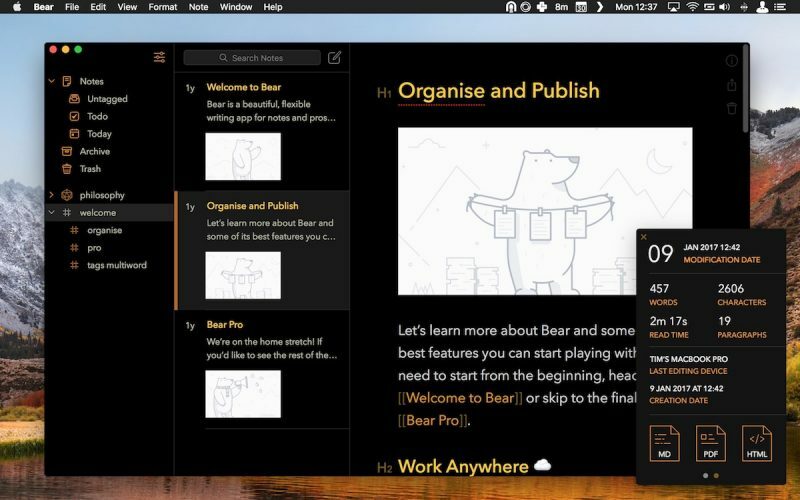 Popular plain text note-taking app Bear reached version 1.5 on Monday, bringing a handful of user-requested features to the platform on iOS and Mac. First up, it’s now possible for users to give all their created tags custom icons, which can be selected from a library of 169 “TagCons”. When a tag is selected on iPhone and iPad, Bear will now display its TagCon in the Notes List header, to remind users of the tag they’re currently viewing. A new archive notes feature is also being introduced in this version, allowing unused notes to be hidden rather than straight-up deleted. Helpfully, archived notes can be searched at any time from the Sidebar, which also gets new Untagged, ToDo, and Today sections. Elsewhere, the Export options have been expanded to allow the exporting of all notes of a specific tag, where sub-tags automatically become subfolders. There’s also a new EPUB export option for users looking to publish in the digital format. In addition, the developers of Bear have added a new iPhone and iPad gesture that lets users pull down to search notes and close preferences, and there’s a new theme for all devices called “Ayu”. On the Mac side of things, the iPhone X-optimized Dieci theme is now available in macOS, and it’s now possible to float individual notes on top of all others, simply by double-clicking a note in the Notes List. Bear is available to download on the App Store for iPad and iPhone [Direct Link], as well as on the Mac App Store.